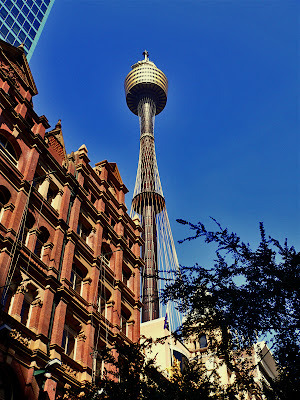 This is called the Sydney Tower. It’s located in Sydney’s CBD. It is 305 meters, 1001 feet, tall and can be seen from just about anywhere in Sydney…just look up. 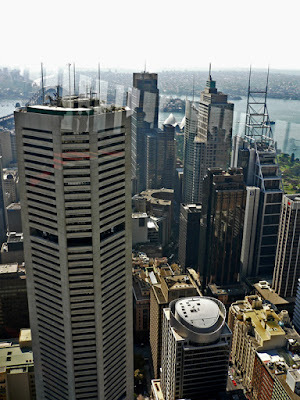 It cost $24, AUD, to take the elevator up to the observation deck. The view is great. Of course I took a few pictures while I was there. A shot of some of the buildings in the CBD. 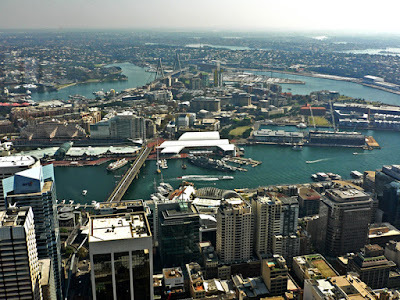 This is a picture showing Darling Harbour. 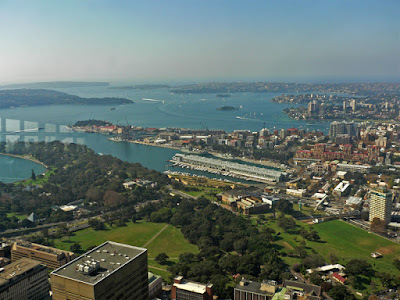 This shot is looking out towards the entrance to Sydney Harbour. These were all taken through windows so there are some reflections. They do offer trips to the top to an outside deck. You need to wear special gear and the whole deal takes about 1 ½ hours. I believe the cost is about $89. I have more from today for a later post.